Dealing With The Christchurch Earthquake Through Sculpture. I carved this Sculpture at a time when Christchurch was experiencing so many earthquakes that it just seemed they would never end. On September 4th, 2010 the city was woken by 7.1 magnitude earthquake from a fault line that was unknown to anyone. That was to be the beginning of a long and very stressful turn of events. No one had any idea that from that day on there would be many many more big earthquakes to come. All with new fault lines and they would continue for years with the worst one hitting on February 2011 with the loss of 185 people. Every time a large earthquake hit the roads would break open and fill with liquefaction. More buildings were damaged and once again homes would be trashed and the clean up would start all over again. So much has happened that everyone has a story to share. Lifes have been changed. For most people it has been a struggle both emotionally and financially. To say that it messes with your head is an understatement. Many people have sought counselling or are taking some form of medication to help them get through each day. I personally needed a creative way to deal with it. I struggled with the concept of dealing with the past and worrying about the future. So many times we were dealing with a false sense of security. Months would pass with no shaking and people would start to relax and then all of a sudden another large earthquake would hit again. Sometimes two big ones within the same day. In a strange way it became the subject of my sculpture, a reflection of remembering the past with all that was lost and looking towards an unknown future with a sense of determination. 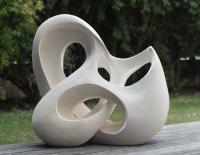 I found it a very therapeutic sculpture to do and it was a way to release built up emotions. Many people in Christchurch were coming up with creative ideas to help deal with the issues that they were facing. 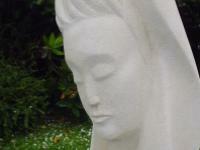 Stone carving was my form of recreation therapy. 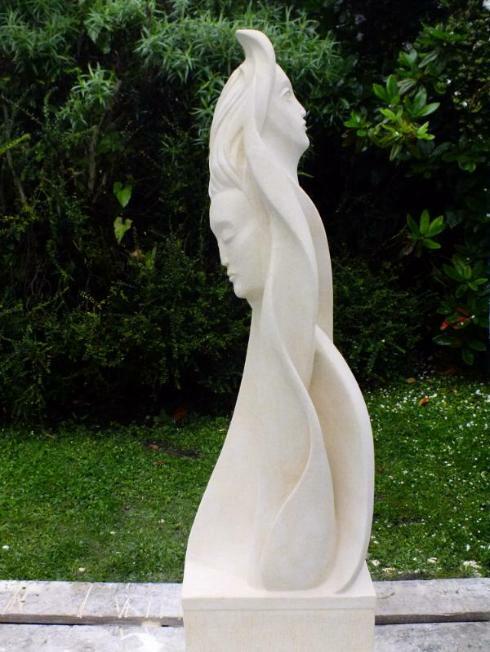 After the sculpture was completed, it was exhibited in a local gallery and within a few days another sizable earthquake hit. It moved outward and turned a half circle but fortunately it did not topple over. Probably because I purposely sculpted it with a heavy base. Fortunately, it sold later that month.. The years have now passed since the city was first hit, but the subject is never far from anyone's lips. People often talk past or post earthquake in their conversation partially on the anniversary. The sculpture is still as relevant to people as the day I carved it. If you would like to leave a comment about this sculpture or you just want to share your story about about how the earthquakes have affected you then please feel free to post your comments below. 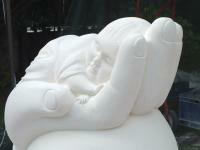 share your comments about about the sculpture or your own story about your experience with the Christchurch earthquakes.